The Pueblo people are Native Americans in the Southwestern United States who share common agricultural, material and religious practices. They speak languages from four different language families, and each Pueblo is further divided culturally by kinship systems and agricultural practices. All cultivate varieties of maize. By about 700 to 900 AD, they began to move away from building pit houses* and began to construct connected rectangular rooms arranged in apartment-like structures made of adobe and adapted to specific sites. By 1050, they had developed planned villages composed of large terraced buildings, each with many rooms. These apartment-house villages were often constructed on defensive sites: on ledges of massive rock, on flat summits, or on steep-sided mesas, locations that would afford the people protection from their Northern enemies. The largest of these villages, Pueblo Bonito in Chaco Canyon, New Mexico, contained around 700 rooms in five stories; it may have housed as many as 1000 people. When the Spaniards arrived in the middle of the 1500’s, they found complex, multi-story villages built of adobe, stone and other local materials. They called them pueblos, or towns, a term that later came to refer to the people who lived in those villages as well. Despite increasing pressure from Spanish and later Anglo-American forces, the Pueblo nations have maintained much of their traditional cultures while developing a syncretic approach to Catholicism. Today, there are currently 21 Pueblos that are still inhabited by some 35,000 Pueblo Indians. Among these, Taos, San Ildefonso, Acoma, Zuni, and Hopi (in Arizona) are the best-known. Pueblo communities are located in the present-day states of New Mexico, Arizona, and Texas, mostly along the Rio Grande and Colorado rivers and their tributaries. This page lists the “living” pueblos of the State of New Mexico. These pueblos are still occupied, speak traditional languages and make their way in the modern world with traditional crafts: weaving blankets and rugs, making pottery, sewing, silversmithing and other classic skills and products. Most accept visiting tourists. These are some of the oldest inhabited structures in the world. The Indian Pueblo Cultural Center is the main source of information for the 19 pueblos in the state of New Mexico. If the text in these articles seems a bit touristy, it may be, I lifted all of this from their website. I wanted today’s story, in their words. This is what it looks like in today’s southwest. As with all Native Americans, help ’em when you can. Acoma is a Keresan-speaking Pueblo that has been occupied from at least A.D 1200, making it one of the oldest continuously inhabited communities in the United States. Called the Sky City, it is built atop a beautiful mesa about 60 miles west of Albuquerque. Listed on the National Register of Historic Places, the breathtaking Pueblo offers a window into traditional life and is a top tourist destination in New Mexico. Acoma is especially known for its centuries-old tradition of making fine-walled polychrome pottery featuring colorful geometric patterns. Pottery remains an important part of the culture and economy of Acoma today with many artists creating high quality, collectible pots using traditional techniques. Cochiti is a Keresan-speaking Pueblo located 55 miles north of Albuquerque. Cochiti artists and craftsmen work in many forms, but they are best known for superbly crafted drums and Storyteller figures. Prized by musicians for their superior quality and tone, Cochiti drums are handcrafted from hollowed tree trunks, usually aspen, and hand-cured leather hides. Cochiti is also the birthplace of Storyteller pottery, colorful clay figures pioneered in 1964 by artist Helen Cordero. This art form features a seated man or woman surrounded by children and is very popular with Native arts collectors. Cochiti artists also create high-quality jewelry, pottery and painting. The Pueblo places premium importance on preserving traditions and cultural practices and has developed many programs to educate the younger generation in their language, arts and culture. Established in the 1300s, Isleta Pueblo has long been one of the largest Pueblos communities, with a current population of more than 4,000. It is located in the Rio Grande Valley fifteen miles south of Albuquerque at what was once an important crossroads of Pueblo and Spanish trade routes. The town was a central gathering place for people from surrounding villages and a cultural capital for other Tiwa-speaking communities. By the 19th century, Isleta was a prosperous farming community with a wide trading network. Today, the Pueblo of Isleta remains a traditional society with people still speaking Tiwa and participating in the yearly cycle of ceremonial events. They continue to observe traditional practices in their homes. In recent years, the Pueblo has experienced a pottery revival with many artists creating high-quality handcrafted pottery in both traditional and contemporary styles. Isleta artists are also known for embroidery, sculpture and jewelry-making. The Jemez are a Towa-speaking people whose modern Pueblo village, known as Walatowa, is located 55 miles northwest of Albuquerque. The Jemez people migrated from the Four Corners area in the late 13th century, and by the time of European contact in 1541 were one of the largest and most powerful Puebloan cultures. Their villages and stone fortresses, sometimes more than four stories high with thousands of rooms, make up some of the largest and most significant archeological ruins in the United States. This early Jemez culture was known for its pottery but the decorative forms died out in the mid-18th century. Pottery-making was revived in the early 20th century and today Jemez bowls, seed pots, wedding vases, figurines, ornaments and storytellers are collected around the world. In addition to swirl and melon style wares Jemez potters are particularly known for their use of sgraffito, a technique of elaborately carving designs into the surface of a clay pot. In addition to pottery, Jemez artists also create beautiful basketry, embroidery, woven cloths, exquisite stone sculpture, moccasins and jewelry. Laguna Pueblo is located 45 miles west of Albuquerque in the beautiful Mt. Taylor foothills. It is the largest Keresan-speaking Pueblo with about 8,000 enrolled members. The ancestors of today’s Laguna people have lived in the area since the 1300s, and the current Pueblo location was established in 1699 after the Pueblo Revolt. Today, Laguna thrives through a vibrant blend of modern and traditional ways. In the 1970s, Laguna artists re-established the traditional craft of pottery-making, creating fine works with red, yellow and orange geometric designs that are similar to that of Acoma Pueblo. Laguna painters and jewelers also continue to preserve traditional styles, while also incorporating innovative designs and techniques into their work. One of the Tewa-speaking people of northern New Mexico, Nambé Pueblo is nestled in the foothills of the Sangre de Cristo Mountains 20 miles north of Santa Fe. 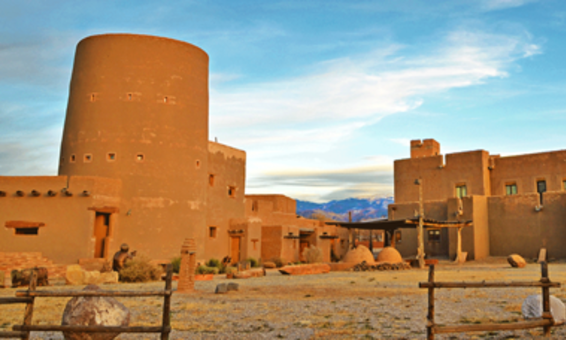 Settled in the early 14th century, Nambé Pueblo was historically known for its robust agriculture and the production of traditional textiles and pottery. There has been a recent renaissance in traditional arts and crafts, with more and more Nambé artists learning the traditional forms and producing high-quality work. Potters are creating handcrafted pots with black-on-black and white-on-red designs similar to the work of Taos and Picuris Pueblos. Weavers have also revived the production of traditional kilts and cotton belts. Ohkay Owingeh, previously identified by non-Pueblo members as San Juan, is a Tewa-speaking Pueblo located on the Rio Grande 25 miles north of Santa Fe. Puebloan ancestors migrated to the area from southern Colorado around 1200 A.D. The Spanish colonizer Juan de Oñate established the first Spanish capital city in New Mexico, Española, near Ohkay Owingeh Pueblo in 1598. The Pueblo Revolt of 1680, the first successful rebellion against the Spanish, was led by the Ohkay Owingeh religious leader Popay (Popé). Today, Ohkay Owingeh Pueblo is home to the headquarters of the Eight Northern Indian Pueblos Council and the Oke-Oweenge Crafts Cooperative, which exhibits the pottery, weaving and paintings of the eight Northern Pueblos. Today, the Ohkay Owingeh people are able to live comfortably in 21st century America while maintaining their traditional culture and worldview. Picuris is a small Tiwa-speaking Pueblo located in the Sangre de Cristo mountains 24 miles southeast of Taos, a location the people migrated to around 1250 A.D. Located near two historically important mountain passes, it was once a large and prosperous Pueblo with an impressive prehistoric Pueblo structure that was seven or eight stories tall. Today it has approximately 300 enrolled tribal members and is one of the most remote Pueblos. In the 1980s and early 1990s, residents completed by hand a major restoration of their 200-year-old adobe church, San Lorenzo de Picuris. A few Picuris artists continue to create traditional arts and crafts, including a beautiful micaceous clay pottery that is distinct to Picuris and Taos. The only Pueblo pottery form that is functional, micaceous clay vessels are recognized by their beautiful, almost metallic shimmer. This type of pottery is utilitarian and usually is not decorated or painted. It is a beautiful and ancient art form that has been carefully preserved by Picuris potters. Pojoaque Pueblo is one of six northern Tewa-speaking Pueblos along the Rio Grande. Founded in the early 1600s, the Pueblo was known as “Po-suwae-geh,” meaning the water drinking or gathering place. Since the Pueblo Revolt of 1680, the Pueblo has been abandoned three times, most recently in the early 20th century, because of illness and lack of water and land for agriculture. Pojoaque was resettled between 1932-34, and in 1936 the Pueblo received federal recognition as a tribal reservation. In recent decades, the Pueblo has experienced a revitalization of its culture, business and economy, as a result of successful commercial enterprises and the efforts of the renowned Poeh Cultural Center. The Poeh has provided arts education to Native artists of many Pueblos and tribes, making a significant contribution to the growth of traditional and contemporary Native American arts. Pojoaque’s traditions are being celebrated and preserved through the Poeh’s commitment to teaching their Native language, traditional song and dance. Today there are potters creating blackware, polychrome and micaceous pottery using traditional methods. Sandia is a Tiwa-speaking Pueblo located just north of Albuquerque in the Rio Grande Valley on a site the Sandia people have resided in since 1300 A.D. The spirituality of the Sandia People is drawn from Sandia Mountain, as well as the plants, animals and resources that have ensured their survival in a desert region. Once the largest Pueblo in the area with over 3000 people, Sandia Pueblo currently has about 500 members. Today the people of Sandia have a number of successful commercial endeavors and also continue to farm and raise livestock along the Rio Grande. One of Sandia Pueblo’s attractions is the 107-acre buffalo preserve established to promote the resurgence of the American Bison, an animal that was nearly hunted to extinction in the 1800s. As a result of efforts like these, buffalo are now thriving in herds across the West. The Originals Index – Cow? What cow? – Buffalo? San Felipe is one of the most culturally conservative of all the Keresan-speaking people. Located about 35 miles north of Albuquerque on the Rio Grande River, the Pueblo is known for its passion for preserving traditional customs and values. The community takes great pride in its ancient origins and heritage and, with a strong ceremonial structure and practice of traditional rituals, has remained a vital and distinctive entity. During its Feast Day on May 1, hundreds of men, women and children participate in traditional green corn dances. There is little historical information on the artistic traditions of San Felipe, though with the revival of traditional Native arts and crafts in recent decades, a handful of San Felipe artists have again started creating exquisite beadwork and heishi. There are also talented contemporary potters working in a range of styles and techniques and known for their willingness to innovate as there is no signature San Felipe pottery style. Many of these artists are self-taught and are interested in preserving the unique cultural traditions of San Felipe. San Ildefonso is a small Tewa-speaking Pueblo located north of Santa Fe along the Rio Grande, a site they may have occupied since before 1300 A.D. Stunning scenery surrounds the Pueblo, with dramatic mesas and mountains rising around it, and the river flowing into White Rock Canyon to the south. The San Ildefonso people maintain a strong sense of identity, preserving traditional ceremonies, dances and practices passed down from their ancestors. Today, San Ildefonso is one of the best known Pueblos despite being one of the smallest, made famous in the early 20th century by the black-on-black pottery style pioneered by legendary potter Maria Martinez. At the time, San Ildefonso was an agriculture-based society with a dwindling population, and this beautiful pottery style that features highly polished and black matte finishes dramatically revived the economic and cultural life of the Pueblo. Since then, the San Ildefonso’ economy has been deeply rooted in the production of traditional arts and crafts. Black-on-black pottery continues to be one of the most prized pottery styles in the world, along with San Ildefonso redware and polychrome, and San Ildefonso potters today are known for producing incredibly artful, high-quality vessels through traditional methods. In addition to pottery, San Ildefonso artists create handcrafted jewelry, moccasins, weavings, carvings and paintings. The Santa Ana Pueblo people have occupied their current site in central New Mexico 16 miles northwest of Albuquerque since at least the late 1500s. Like other Pueblos, this Keresan-speaking people believe their ancestors originated from a subterranean world to the north, and their original ancestral village was built against a mesa wall on the north bank of the Jemez River, a place potters return to each year for gathering clay. The annual cycle of life at Santa Ana continues to be tied to the solar calendar and agricultural and hunting seasons. The Pueblo has close ties and a tradition of cultural exchange with nearby Zia and San Felipe Pueblos. Since the early 1980s the Pueblo has pursued a strategy of developing tribal enterprises, seeing economic independence as a key factor in preserving traditional concepts and values. Today it is known for its spirit of entrepreneurship, with businesses offering tribally grown blue corn products, traditional apparel, plants and food, as well as a hotel and golf courses. The Santa Ana people began to revive their ancient arts during the 1970s when interest grew in Native American art. Today there are artists creating traditional jewelry, pottery, ceremonial clothing and embroidery. Santa Clara is a Tewa-speaking Pueblo located along the Rio Grande north of Santa Fe, near Española, a site occupied since the late 14th or early 15th centuries. Santa Clara is known for the majesty and beauty of its landscape as well as its ancestral home, the Puye Cliff dwellings, a famed historical and archeological landmark located near the modern Pueblo. The Santa Clara people have preserved many of their ancient traditions, with a strong tribal government, a strong commitment to education and a prosperous economy. Santa Clara takes great pride in its rich legacy of pottery-making and today is home to one of the most vibrant Pueblo communities of potters creating high-quality traditional vessels. Their handcrafted blackware and redware with intricate, precise engravings are one of the most widely collected forms of Pueblo pottery. The technical excellence, innovation and imagination of Santa Clara potters have helped sustain and promote Pueblo pottery around the world. In addition to pottery, the Pueblo has produced notable sculptors and painters, and there are also artists creating embroidery, beadwork and weaving. 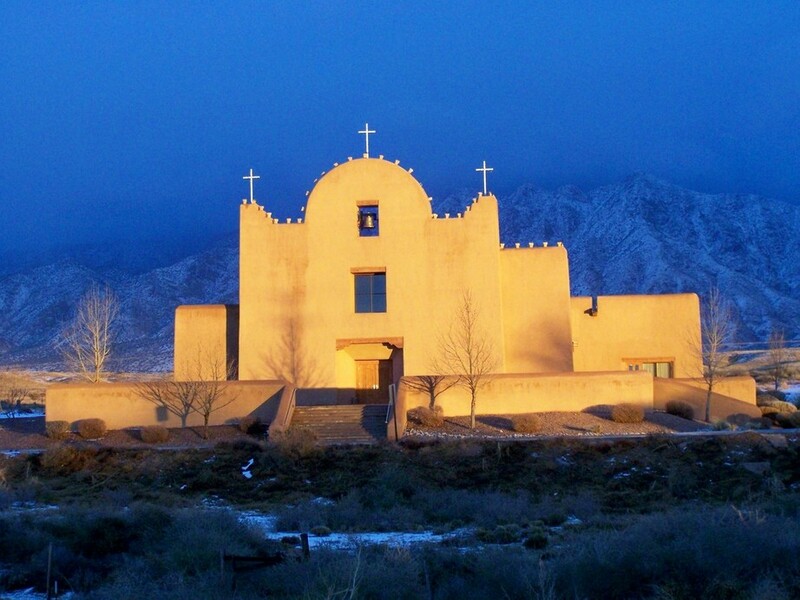 Located on the Rio Grande 25 miles southwest of Santa Fe, Santo Domingo is one of the largest Pueblos in New Mexico. This Keresan-speaking Pueblo is known for carefully preserving its traditional way of life and its legacy of bead-making and traditional pottery. It was established in the 15th century, though the current Santo Domingo village was built after a devastating flood in 1886. Every August, on the Feast Day honoring the Pueblo’s patron saint, hundreds of Santo Domingo people participate in traditional corn dances, drawing visitors from around the state. For hundreds of years, Santo Domingo artisans have been creating beaded jewelry, known as heishi, by cutting and rolling turquoise, stone and shell by hand. Historically, the people of Santo Domingo were extremely successful traders, carrying their jewelry and other crafts as far away as Mexico, the Pacific and Plains. Today, Santo Domingo artists continue to create exquisite handcrafted beaded jewelry as well as shell mosaic inlay and silver jewelry, and these distinctive jewelry styles are prized around the world. The traditional pottery of Santo Domingo is also well known, with many artists making simple jars of buff clay decorated with black, red or brown geometric patterns. 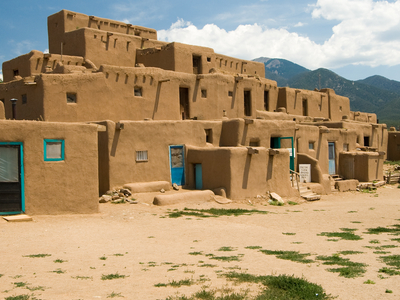 Taos Pueblo today stands as the largest surviving multistoried Pueblo structure in the United States, and is the only living Native American community that has been named a UNESCO World Heritage Site and a National Historic Landmark. Most of the present buildings were constructed between 1000 and 1450 A.D., all made from traditional adobe, which is earth mixed with water and straw. This Tiwa-speaking Pueblo became an important trade center for Plains Indian, Spanish and Mexican traders because of its location near the mountain pass that connected the region to the Great Plains. In the 17th century Spanish settlers were attracted to Taos, because of these trade networks, its mission, and abundant water, timber and game. Conflict between these settlers and Taos Pueblo contributed to the Pueblo Revolt of 1680. Today, the people of Taos Pueblo continue to live according to traditional values and are careful not to share their oral traditions, history and rituals with non-tribal members to preserve their traditional way of life. Taos is known for its traditional micaceous clay pottery, a type of utilitarian ware that has a beautiful metallic shimmer created by the high mica content in the clay around Taos. Taos artists also create elegant handcrafted leather goods, including moccasins, boots and drums, as well contemporary sculpture, painting and jewelry. Tesuque is a small Tewa-speaking Pueblo located ten miles north of Santa Fe, a site it has inhabited since 1200 A.D. The Tesuque people played an important role in the Pueblo Revolt of 1680, with two of its members acting as messengers who spread news of the uprising throughout the territory. Tesuque has a great reverence for its traditions and continues to practice ancient customs despite pressures from other cultures. Farming remains one of the primary activities of the Tesuque people, and there are also Tesuque artists creating traditional work, including pottery. Handcrafted figurines decorated with colorful designs are a popular form with collectors of Native American art. Tesuque artists also create silver and bead jewelry, traditional clothing, painting and weaving. Zia is a small Keresan-speaking Pueblo located about 35 miles north of Albuquerque on a site overlooking the Jemez River, where their ancestors have lived since the 13th century. The Zia are well known to the people of New Mexico for their sun symbol, which depicts a circle with line emerging at the four cardinal directions. The symbol appears on the state flag and is the official New Mexico State insignia, adopted as an emblem of friendship among cultures. Once one of the largest Pueblos, Zia’s population had fallen to less than 100 at the turn of the 20th century as a result of illness and now stands around 700. Today the Zia community farms and raises cattle and livestock, maintaining a strong sense of culture and identity. Artists of Zia are known for producing beautiful traditional work, especially their handmade pottery. Their redware and polychrome pottery often features designs painted in brown or black and the bird motif that is a signature element of Zia pottery. Zia artists are also known for painting, as well as traditional weaving, carving and basketry. Zuni Pueblo is located in a beautiful valley surrounded by dramatic mesas about 150 miles west of Albuquerque near the Arizona border. With about 10,000 tribal members, Zuni is the largest of the 19 Pueblos and the only Pueblo to speak the Zuni language. For thousands of years, the Zuni people have farmed the land along the Zuni River, raising corn, beans, squash and other vegetables. Their cultural and religious traditions are rooted in their deep connection to the mountains, forests and deserts of their homeland. Considered the most traditional of all of New Mexico’s Pueblos, the Zuni people have a unique language, culture and history that is the result of their geographic isolation. They express their cultural traditions through art, particularly through painting, pottery, jewelry and fetish carving. The Zuni religion, language, agriculture and culture are passed from one generation to the next and continue to be essential parts of modern life. Today the majority of Zuni people make a living in the arts, and Zuni artists are famous for their handcrafted silver inlay jewelry, gemstone jewelry with cluster work in the petit point and needlepoint styles and beautiful hand carved fetishes. There has also been a resurgence in traditional pottery and more and more Zuni artists are making exceptional pottery from handmade natural clay, many with traditional heart-line deer, rain bird and rosette designs. The sophisticated and extraordinary art forms of the Zuni are collected around the world and have contributed to the continuing popularity and high level of craftsmanship of Native American artwork.